Your Passion. Our Technology. Student Success. ^ INVESTOR FAQs. Texas Instruments. [2007-01-29]. （原始内容存档于2007年1月27日）. ^ 2.0 2.1 2.2 2.3 2.4 2.5 Texas Instruments - Annual Report. [13 July 2018]. ^ Company Profile for Texas Instruments Inc (TXN). [2008-09-30]. ^ "TI Mailing Address 页面存档备份，存于互联网档案馆." Texas Instruments. Retrieved on June 12, 2009. ^ Texas Instruments to buy National Semiconductor. BBC News. April 5, 2011. ^ Databeans.net 互联网档案馆的存檔，存档日期2013-01-16.. Databeans.net. Retrieved on April 19, 2012. ^ Texas Instruments Closes $6.5B Acquisition Of National Semiconductor. [September 23, 2011]. ^ Hendricks, C.A. ; Kelbaugh, R. Implementing Six Sigma at GE. The Journal of Quality and Participation. 1998, 21 (4): 48–53. ^ 11.0 11.1 TI web site history page,(c. 2008), (HTML), Texas Instruments, accessed September 6, 2008. ^ IEEE Spectrum. 2004年5月: 48. ^ The Chip that Jack Built, (c. 2008), (HTML), Texas Instruments, accessed May 29, 2008. ^ Robert Noyce[永久失效連結], (n.d.), (online), IEEE Global History Network, accessed July 8, 2008. ^ Texas Instruments Speech - Integrated Circuits. Datamath Calculator Museum. [2008-09-07]. ^ 关于德州仪器 (TI) 公司. 德州仪器官方网站. 2011-01-27 （中文（中国大陆）‎）. ^ Analog Market to Grow 17%. Electronic, Design, Strategy News. March 28, 2006 [2008-07-04]. （原始内容存档于2007年9月27日）. ^ "Manufacturer of the Year", World Trade, Vol. 20., No. 5, May 2007, p. 20. ^ 2007 World's most ethical companies - Ethisphere Institute. （原始内容存档于2011-02-27）. ^ 2008 World's most ethical companies - Ethisphere Institute. （原始内容存档于2011-01-27）. ^ 2009 World's most ethical companies - Ethisphere Institute. （原始内容存档于2011-01-28）. ^ 2010 World's most ethical companies - Ethisphere Institute. （原始内容存档于2011-01-24）. ^ Texas Instruments to acquire Amati Communications for 29.9 times revenue. Weekly Corporate Growth Report. 1997. ^ Texas Instruments Inc acquires GO DSP Corp.
^ Dorsch, Jeff. TI to Acquire Telogy for $457M. Electronic News. 1999. （原始内容存档于2012-07-17）. 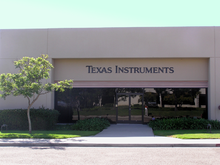 ^ Texas Instruments to Acquire Burr-Brown. ^ TI Acquires Luminary Micro. ^ Texas Instruments to Acquire National Semiconductor.